1) A New friend- I haven't really made any new friends lately, but I'm always thankful for them when I do. Friends are always such blessings to have. 2) Something Shiny- I'm thankful for God's son Jesus whose love and light shines so bright. Without his shining light, we would be doomed for darkness for all of eternity. I'm so thankful Jesus died for our sins so that we could have eternal life. 3) Someone unexpected- this year I have dealt with a few unexpected people, but I am so thankful that I have. God softened my heart and showed me that I needed to love these people and be a light to them. I learned some great lessons from these unexpected people and it changed me into a much better person. These people also taught me that I should never judge someone. 4) Something Ordinary- I am very thankful for Coffee! Without it, I would not have the energy to focus on Raylan or tons of homework. 5) A Person that I have know for a long time- I'm thankful for my friend's Adora, Melissa, Tiffany and Tina. We have been friends for many many years. I'm so thankful I have them in my life and can talk to them at anytime. We may not see each other as often as I would like, but I know that they are always there for me as I am for them too. 6) Somewhere you go everyday- I go to the Lord in prayer everyday. I am so very thankful that I have a personal relationship with our Lord and Savior and that I can talk to him about anything. I also go on daily walks in nature. I'm thankful for the place that I live that allows me to do that. It's so good to be able to be out in nature and clear your mind. 7) Someone who has taught you something- This goes along with number 3 from the unexpected people, but I am also thankful for my son Raylan. He teaches me what love truly is every single day. As parents we think we are teaching our children, but they are the ones who are teaching us. They teach us to love and how to be a better person. I am so very thankful that God blessed me to be a mom to Raylan. 8) A far-away place- I'm thankful to have travelled to Georgia in the last few weeks. It's about ten hours from where we live. I'm thankful to have seen and experienced such a beautiful place and to be able to have a change of scenery. 9) Something that is saving your life right now- I am thankful for Jesus and his saving grace. If it wasn't for his love, I would be lost and would go to a terrible place or torment. Jesus is the true life saver. 10) Someone you see everyday- I'm thankful to be able to see my dad and brother everyday. They live next door and I'm so thankful that the Lord has blessed me to be able to spend time with them like I do. My dad has a lot of health issues so I pray that the Lord blesses my dad with many more years. 11) Something I enjoy doing- I am thankful for baking, blogging, photography and reading. These activities are so relaxing for me and I truly enjoy doing them. They are stress-relievers and really help with my anxiety. 12) Someone female- Even though my mom passed away in 2005, I will forever be thankful for her. She was such a wonderful mom and had such strong faith in God. I can only hope to be half of the woman that she was. She will always be my biggest inspiration. 13) A special place- Gatlinburg, Tennessee will always be such a special place to me and I will forever be thankful for it. It's the last place I got to vacation with my mom before she passed away and it's the place where Justin and I spent our honeymoon at. Of all of the places in the US, Gatlinburg will always be my favorite and will hold a special place in my heart. 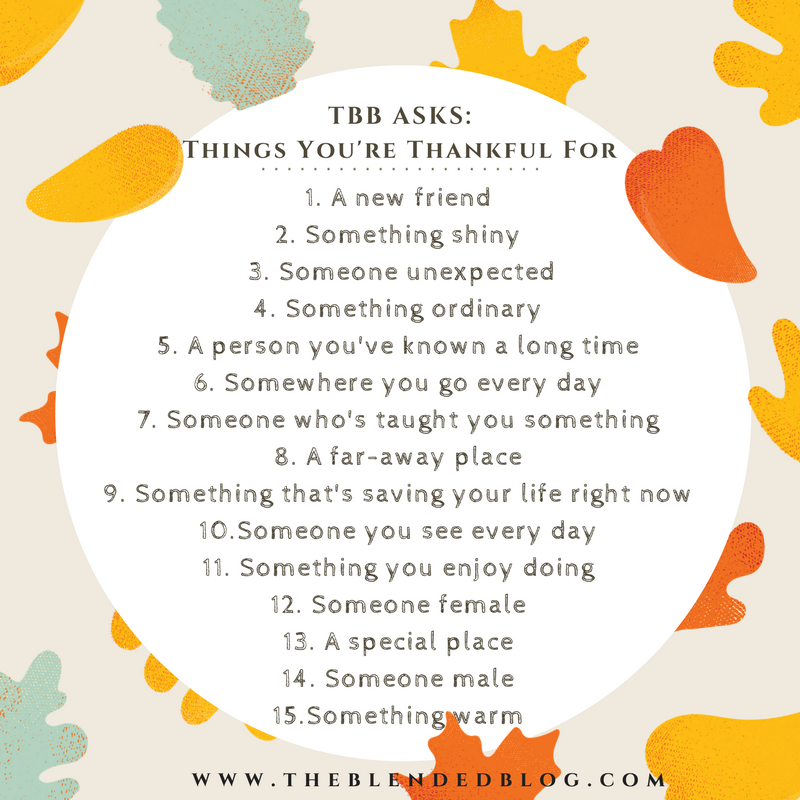 14) Someone male- I am thankful for my husband. He's been my best friend since I was 16. Yes, we were high school sweethearts! I'm thankful for the man that he has turned out to be and that he is a great provider for our family. 15) Something warm- I'm thankful to have a roof over my head, a warm bed to sleep in and warm clothes to wear. We truly are blessed more than we realize and more than we deserve.